Lóng tóu kào in language. Lóng tóu yú in language. Department of Fisheries (1999) Ecoonomim Marine Fish Species in Myanmar (in Myanmar Language). : Sea fisheries resources survey & research unit, Department of Fishery (Gyogone), Insein, Yangon. Kharbhari, J.P. (1982) Marine Fisheries Information Services India. : Central Marine Fisheries Research Institute:18-23. Khin, U. (1948) Fisheries in Burma. : Gov't. Printing, Rangoon. 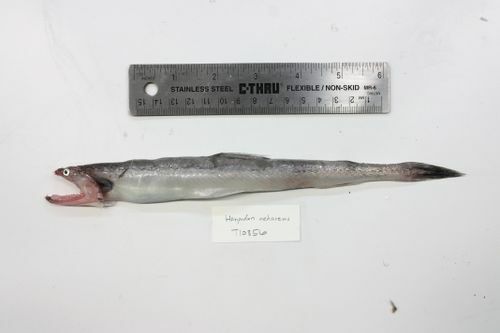 180 p.
Russell, B. C. / Carpenter, Kent E., and Volker H. Niem, eds., 1999: Synodontidae: Lizardfishes (also bombay ducks, sauries). FAO species identification guide for fishery purposes: The living marine resources of the Western Central Pacific, vol. 3: Batoid fishes, chimaeras and Bony fishes, part 1 (Elopidae to Linophrynidae). 1928-1945.